In his post, Lola points out that 75% of tenants' income goes out in tax, one way or the other. Owning a three bedroom home in the UK comes with average annual running costs of almost £20,000 which equates to £1,634 per month. Renting a three bedroom home is only slightly less expensive at just shy of £19,000 per year (£1,576 per month). Where it all goes is in the infographic above. 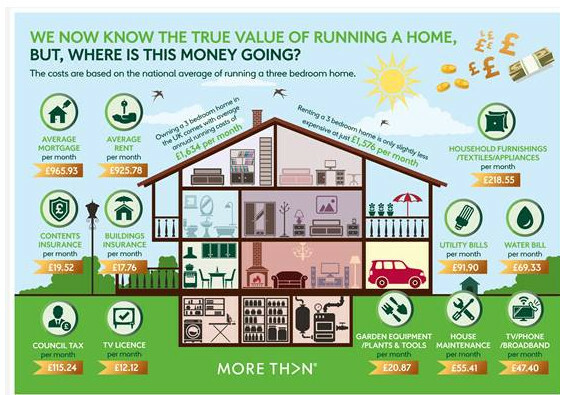 Who would have thought we spend so much money on gardening? Some of those figures look plausible, some of them are clearly wrong. Suffice to say, they are looking at recent purchasers, which is why the mortgage repayments are so high, they are in the same position as tenants so end up paying the same % of their income on somewhere to live. As far as the garden is concerned it costs me £25/PM to have my grass cut (I work away from home for a lot of the time so can't do it myself). On top of this are other garden costs so it is underestimated in the example. Regarding tax freedom day. Total UK incomes are approx £1trn. Total UK taxes approx £600bn. Shouldn't tax free day be July rather than May? I expect the May date allows for the taxes paid by businesses, i.e. personal taxation only.